Every film score presents a unique dramatic and emotional challenge. Trying to find music to accompany a film that so thoroughly chronicles the richness of Tibetan Buddhism, the political tragedy of occupation, and the countless stories of personal sacrifice and suffering, was a vast puzzle to solve. Indeed, in realizing the pieces that would become the soundtrack, Beal’s and Khechog’s goal was to make the authentic Tibetan musical elements resonate with what would be a largely western audience. It is evident upon first listen that the music that would become the soundtrack to Tibet: Cry Of The Snow Lion is a result of the artists’ special bond and mutual respect as well as their disparate cultural and musical backgrounds. Nawang’s personal relationships with many of the people chronicled in the film added a heightened emotional sensibility to this passionate and radiant work. Utilizing many extraordinary field recordings that the filmmakers captured on their many visits to Tibet, Jeff Beal’s first step was to incorporate these elements into “instruments” with which to write. 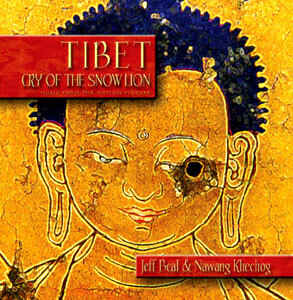 These field recordings in fact included many inspiring Tibetan chants that became the basis used to create themes and cues including “One Human Life”, “The Celebration”, and fervent title track “Cry of The Snow Lion”. Flute and piano improvisations evolved into the tracks “The Mandala” and “Peace Prayer”. On other tracks the majesty of the film’s images became the artists’ muse. It is in that spirit that we are honored to present Tibet: Cry Of The Snow Lion. To freedom…. Tibet: Cry Of The Snow Lion will be released as an enhanced CD containing three music videos featuring footage from the film and a bonus MP3 track “Freedom Suite (Duet for Trumpet and Tibetan Horn)”, believed to be the first ever duet improvisation between a jazz trumpet player and a Tibetan horn player! A portion of the proceeds from the sale of the CD will be donated to The Dalai Lama Fund. Born in Tibet, Nawang Khechog spent his earliest years as the child of nomads. In his boyhood he first learned to play the bamboo flute, an ancient instrument popular in rural villages throughout Tibet. After the brutal subjugation of Tibet by Chinese Communists in 1949, Nawang and his family escaped to India. There he studied meditation and Buddhist philosophy under many Tibetan masters including His Holiness The Dalai Lama, a path he followed as a monk for eleven years - four of them as a hermit. In 1986, he emigrated to Australia where he first performed, and his recordings achieved bestseller status. Known primarily as a master wooden flute player, Nawang also possesses a beautiful singing voice. His live performances with the likes of Philip Glass, Laurie Anderson, Paul Simon, Natalie Merchant, Paul Winter, Trey Anastasio (Phish), Ustad Sultan Khan and Baba Olatunji have received international acclaim. Nawang was nominated for a Grammy in 2001 for his collaboration with R. Carlos Nakai, William Eaton, and Will Clipman for their album In A Distant Place. Emmy award winning composer Jeff Beal is a member of a new generation of eclectic composers. He is fluent in the diverse languages of jazz, classical, contemporary, electronic and world music. Beal’s compositions can be heard in movie theaters, concert halls, CD recordings and on television. As a film composer, Beal scored Ed Harris’ critically acclaimed directorial debut, Pollock. Other scores include director Bob Rafelson’s latest feature No Good Deed, William H. Macy’s acclaimed Door to Door, The Passion of Ayn Rand, From the Earth to the Moon (episode 9), and the theme and underscore for USA’s hit series, Monk, starring Tony Shalhoub. He is currently collaborating with director Jessica Yu on her feature length documentary, In the Realms of the Unreal. Beal recently received an Emmy award for his score to the NBC Sports division's documentary, Peggy and Dorothy. Beal recently composed a full orchestral score to Buster Keaton’s silent masterpiece The General. Beal’s concert music has been performed by many leading orchestras and conductors, including the St. Louis, Rochester, Pacific, Frankfurt, Munich, and Detroit Symphonies. Beal’s commissioned works have been performed around the world. His jazz CDs have received critical notice and established Beal as a respected and critically acclaimed recording artist. "Cry of the Snow Lion"